I have long stated that horizontal wagers are a tricky business. Not only is it difficult to pick three winners in a row, but one is also at the mercy of the crowd, dependent on Lady Luck for a decent price or two to make the wager worthwhile. Of course, we all know that there can be a big difference between practice and theory, so I decided to put my money where my mouth is this weekend and test my pick-3 theories on real, live races… with real (though fortunately not live) money. On Saturday, I looked at races from two of my favorite winter tracks, Aqueduct and Tampa Bay Downs. Now, there were two things I liked about this particular sequence: 1) The top three contenders in the opening leg had a combined morning-line odds ranking of 12, while the final leg had a ranking (after scratches) of 18; 2) Sandwiched in between those events was the fifth race, in which N. F.’s Destiny looked like a virtual lock following the withdrawal of Driven by Solar, Isn’tlovejustgrand and Warrioroftheroses. 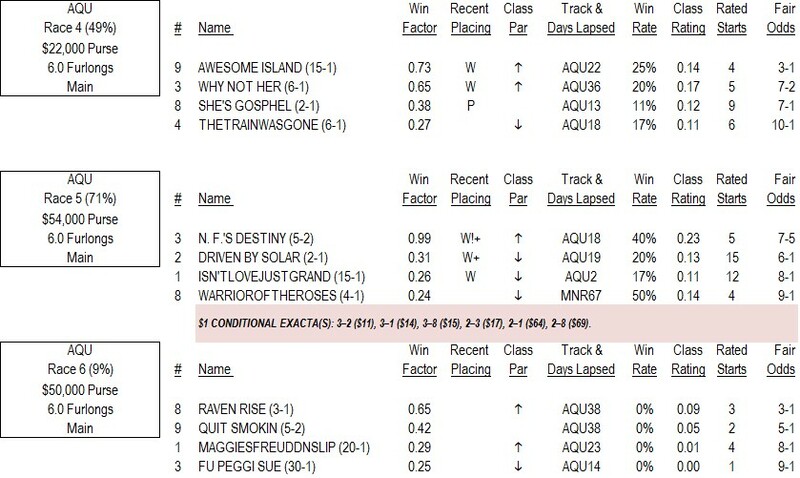 As it turned out, I decided to toss out 3-Why Not Her in the opening leg due to the fact that her speed and pace figures were horrible (frankly, Awesome Island’s weren’t a lot better… but she was 38-1, whereas Why Not Her was 6-1). Well, She’s Gospel led from flag fall to finish in the fourth race, N. F.’s Destiny cruised in the fifth event and Maggiesfreuddnslip scored a predictable 32-1 upset in the sixth. The $1 pick three paid $214.25 (my actual bet on TwinSpires.com is listed below). I was fond of this particular sequence for different reasons than the Aqueduct sequence. Despite the fact that he was favored on my WFR line, I thought Dazzlin Dr. Cologne was very beatable — at short odds — in the ninth race. Look at his past performances and see if you can tell why. Notice that for all intents and purposes Dazzlin Dr Cologne, who was the odds-on favorite in this race, needs the lead to win. 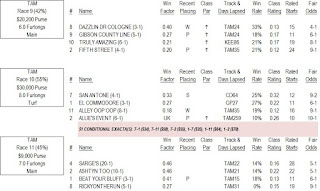 Yet, even with the scratch of the ultra-speedy Raven Train, the Tampa Bay ninth was loaded with early speed types and the only times the eight-year-old gelded son of Cutlass Fax had to exert himself in the early going (-11 ESR on Dec. 26 and -10 ESR on Jan. 10, 2012) he recorded subpar speed figures. I also liked the final leg of the sequence, where Sarge’s, Ashtyn Too and Beat Your Bluff had a cumulative odds ranking of 17. I admit when it came time to bet, I kind of wimped out and decided to use (the bad) "Doctor" just in case I had misjudged the early pressure he would face. I also threw in 6-Follow the Rhythm, who had good pace figures, in the ninth; and I tossed in 8-Sleepless Knight in the eighth for the same reason. It turns out I needn’t have bothered. 2-Fifth Street won the ninth, 11-Alley Oop Oop triumphed by the scantest of margins in the 10th and Ashtyn Too found an opening on the rail to annex the 11th. Try this approach to your own horizontal wagers and see if it helps. By looking for a leg or two that you have a strong opinion in — along with some value — you may boost your ROI at the track, along with your enjoyment of the races. 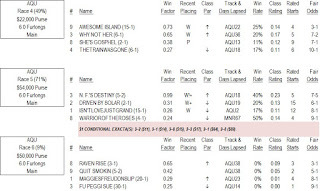 If you’re like a lot of my degenerate handicapping friends and love to delve into horses’ pedigrees, you’ll want to check out American Produce Records from Brisnet.com. Not only will you get great stats, you’ll get ‘em for FREE until the end of the month.